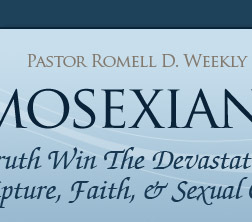 In Homosexianity, Pastor Romell Weekly dives headlong into the mire of homosexuality and Scripture—two things long thought to be, by their very natures, diametrically opposed to one other. With unwavering directness, he tackles issues related to the interpretation and application of Scripture, and the cultures of society and the Church that have led to the spiritual and physical demise of so many people who struggle to make sense of their non-heteronormative sexual identity. 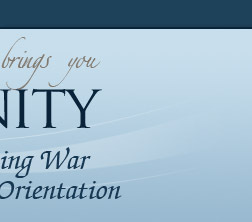 Homosexianity is divided into three (3) sections, making it easy to navigate and understand. Section 1 is purely theological, dissecting every passage commonly believed to reference homosexuality from Genesis to Revelation. Section 2 builds upon the foundation laid in Section 1 by applying the biblical witness to the modern church and society, addressing issues such as whether people are born gay, the place of gay people within the Church, and gay marriage. 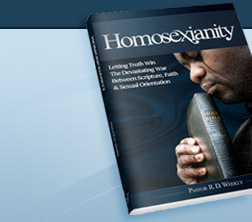 In Section 3, Pastor Weekly exposes the gritty realism of his own personal journey from being staunchly opposed to homosexuality because of what he believed the Bible taught on the subject, to now fully embracing it is a God-honored variation in human sexuality that is not only perfectly natural, but is also his own sexual orientation. PLEASE NOTE: For international shipping, please order through Amazon.com. Did You Know: You can also add his next two books, The Rebuttal and Homosexuality and the Death of the Church, to your order for a discounted price? They retail for $19.95 and $11.95, respectively, but you can order it today for only $14.95 and $9.95! 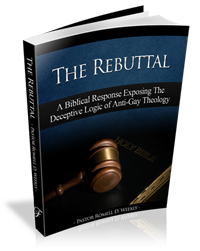 In The Rebuttal, Pastor Parks-Weekly challenges over 200 specific arguments used by the leading anti-gay pastors and scholars. If you want a go-to resource to combat every argument you're likely to come across, you definitely need The Rebuttal in your arsenal! 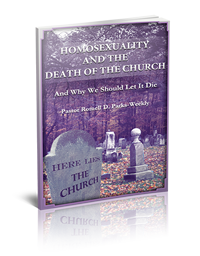 In Homosexuality and the Death of the Church, Pastor Parks-Weekly examines biblical prophesies about the destiny and the Church, and how homosexuality will play a major role in them. In fact, it may just be the issue that leads to the death of the Church. But will that be a bad or a good thing? QUANTITES: Due to limitations with PayPal's order system, DO NOT update the quantity listed on the PayPal order screen. If you want to update your quantities, remove the item from your PayPal cart, return to this page, and update the quantities from here. You will notice when returning to the PayPal order screen that "QTY" at the end of the item description will reflect your new quantity. SHIPPING: Orders are shipped within 2-3 business days to the address provided on the next screen. RETURNS: Returns are accepted within 7 days of your receipt of the book. The book must be in new condition when returned. 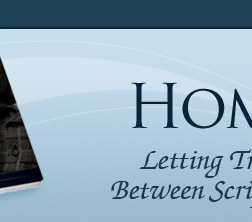 Refunds are processed within 3 business days of receipt of the returned book. "This book is very well written. His argument is logical and closely follows the scriptures... 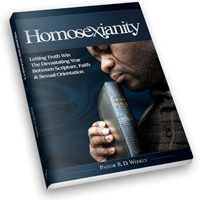 I would recommend it for any homosexual Christian who is struggling with the scriptures. "